At SF Social our goal is to build active, social, and happy communities. When people play sports and games together new friendships blossom and people discover lifelong passions. Our free agent system helps those that are new to the city make friends with their neighbors and find out about great local parks. 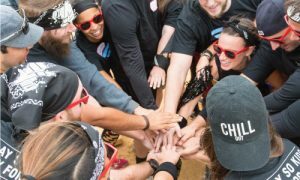 We emphasize diversity and inclusion in both our leagues and staff to make sure that everyone feels welcome at SF Social. When people come together in public spaces it creates fun and inclusive neighborhoods. Our leagues encourage stewardship of San Francisco’s beautiful parks as more people use and appreciate them. We have non-profit partners throughout the city, and in collaboration with them we are always finding new ways to give back to this amazing city we call home. In partnership with the San Francisco Department of Parks and Recreation, we are volunteering our staff and equipment to organize free-play at the Civic Center on Tuesday, Wednesday, and Thursday evenings. The goal is to encourage use of the park for recreation and fun, and bring local residents together to build a sense of community in the surrounding area. Families and individuals passing through the park are encouraged to join our staff in games of volleyball, spike ball, and bocce. This has already been successful (and fun), and one evening resulted in a lively game of volleyball featuring staff, several local families, a couple of French tourists, and a local dog. We hope to see you out there! Through our partnership with the non-profit organization Treasure Island Sailing Center, a large portion of the profits from our adult sailing league go to sponsoring low-income kids participating in sailing classes and camps. This means that we are able to help both adults and kids take to the water for the first time, and experience all the joys that come with that! Check out tisailing.org to learn more about how you can support their awesome work in the SF community.